If you’re wondering what is going to happen with the Dotto Trains this year, we’ve got an update on the situation. VB readers may remember that the Isle of Wight council made the decision (as part of their budget cuts) last year to cease the tourist Dotto Train services in Shanklin, Sandown and Ryde. Back in November (19th) last year, the tender for these three trains was advertised in the County Press. This advert, as well as information sent to 13 individuals or organisations (who had either previously expressed an interest or were known to deal in road trains) resulted in eleven tender packs being issued. From that, seven tenders were received and considered by the council, three of which came from Island concerns. 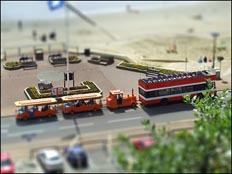 Out of the seven bids, the contract went to a road train dealer in Llandudno, Wales who placed the highest bid. IW Council head of highways and Transport Peter Hayward said: “In the current climate when the council is having to concentrate its resources on statutory services such as concessionary fares, it was not felt that spending money providing Dotto Trains was justified. “Mindful of the fact the trains were nearing the end of their working life requiring a replacement at a significant cost of £100k each, several months ago a decision was made to cease funding the Dotto Trains and the relevant town and parish councils and local members were informed. The council also told us that the new owner of the three trains is prepared to lease the trains back to anyone wanting to continue the service when the holiday season starts. Town and Parish councils might want to consider increasing their precepts and taking on the cost of running the Dotto Trains throughout the summer. Not knowing whether the trains have been re-conditioned and given that the council told us that the road trains were nearing the end of their working life, we’re wondering how much of a good deal that’ll be. 44 Comments on "Dotto Trains Sold To Welsh Bidder"
Surprising that anyone should bid for them if they are worn out! There were issues with the braking systems and parts were increasingly difficult and expensive to obtain. The most relaible one (and well made) was the Ryde one which it’s type is still in production. The other 2 are obsolete. The chap has probably already got a buyer for ie a zoo,theme park,or a large holiday site.The sort of place that already has dotto trains and needs the spare parts and can do the work on site.On private land they do not need an MOT or TAX and the insurance is covered in the price of the ticket or your holiday.Still charge for the ride! The Tender for these trains stated thats price would be the only consideration. The one thing that you may be wrong about here is that Shanklin Town Council probably knows exactly how much the costs are. After all the Leader of the Council is a Shanklin Town Councillor and it really would defy belief if he didn’t know the exact situation. David Pugh is the Leader of the Council, EVERYTING crosses hir desk. HE IS I CHARGE! you are implying that this council knows what it is doing!!!!!! Well you seem to know all about it No. 5! Does anyone know who the buyer was? How much did the train go for? axccoring to the County Press, the terms of the ‘deal’ are confidential so obviously you must have inside info? It sound weird if that price were for all three trains!! Anyone know who bought them? Not just to where. I would like to get a hold of him. You seem to well informed! Be interesting to know where your info is comming from. So we know the info is accurate. Paul, are you really suprised? After all they are quite happy to close the Tourist Info Centres which are a front line service for the main industry to the Island. Hardly installs confidence in the council’s interpretation of ‘impact on the local economy’ does it? By the way, you would of needed 6 people as each train needs a 2 man crew. Lol Ron! Where have you been over the last few weeks? The Island Tourism is being slowly wound down by the council by closing the Info Centres at the end of March… hardly raises our ‘tourism game’ does it? The Dotto trains were the height of our tourist trade…have you looked around lately. There has been no investment, private or council, in the tourist trade of the Island for decades..worn down nostalgia is our only selling point. Dotto trains don’t have MOTs – they are exempt. How do you know Southern Vectis only maintained them to a minmum standard? Have you some proof? All were claimed to be un-roadworthy …all gained there road worthyness cert. once sold. One has recently been re-sold for three times the amount all three cost…at the very least the council have sold an assett for far less than it as worth. Since when were they exempt? Can you provide proof because I think you are wrong! A nice little earner for someone. I’m sure nothing bent here, let’s all move on. I found this forum very interesting. From my understanding 3 trains were sold for Â£18000, that’s Â£6000 each and then the purchaser sold on one of these for Â£54000. Thats a good profit.